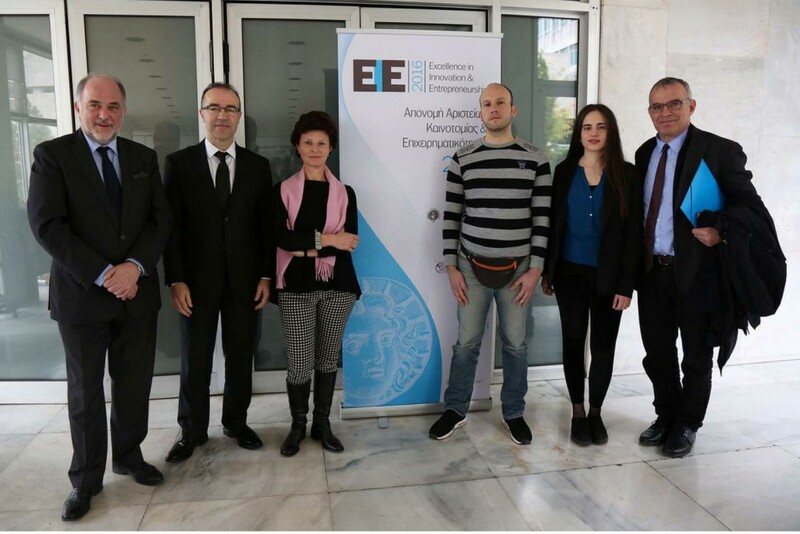 Garyfalia Minou, i-MBA alumna, was the recipient of the 2nd prize at the “Excellence in Innovation & Entrepreneurship Awards 2016“, organized by the National Hellenic Research Foundation, the General Secretariat of Research & Technology and the Athens Startup Business Incubator of the Athens Chamber of Commerce & Industry, with the support of the European Commission Representation in Greece. The Awards Ceremony was held on Tuesday, January 31, 2017 at the National Research Foundation. The aim of these Awards is to highlight and reward innovative proposals that contribute to the development of systems and applications based on new technologies, the integration of environmental considerations in the design of innovative products and services, the widespread use of new information and communication technologies, and the creation of new enterprises in traditional sectors, leveraging innovation in the latter. Garyfalia participated in the competition with a business proposal entitled “Transparent solar power panels, mounted on a solar hot water heater“. The main problem she is trying to solve is how to provide a dual solution of producing electricity and hot water with a compact product that fits on all rooftops. A sample of the product -a new type of solar water heater- has already been designed and produced. At a later stage, a solar transparent panel will be engraved on the collector panel of the water heater to produce electricity. The photovoltaic panel is designed with a 4th generation technology that is acting as a filter: It allows the solar energy to pass through the photovoltaic glass, absorbing 30% of the energy in order to produce electricity and leaving 70% of the energy to pass through the second glass to heat the water. The product is already patent protected. It is also worth noting that in November 2016 Ms Minou received the 1st prize in the category “New Product Development” of the 6th Entrepreneurial Competition of the Innovation & Entrepreneurship Unit of AUEB. She participated in the competition with the project Greek Light Cam, an innovative security system that she jointly designed and developed with another i-MBA alumna, Ms Helena Stamou. Garyfalia is a graduate of the Department of Electronic Engineering at the TEI of Crete. In September 2014, she was one of the recipients of the scholarships offered by MSD to young entrepreneurs and researchers with innovative ideas to attend the i-MBA program and advance their business ideas. She graduated from the program in December 2015 and she currently pursues her PhD in the area of Embedded Systems & Techno economics, at the Department of Informatics and Telematics of Harokopio University.